After the full moon on the 28th, we are still using 1/2 ounce Cojo Minnows with three inch body, 1/2 ounce Sassy Shad with a 3 inch body in the Glow or White colors and 3" Chug Bugs. Remember the trick to using these baits is to retrieve it fast as soon as it hits the surface of the water. Reel it in keeping the lure right near the surface of the water. Alot of the fish we are catching are on the small side but are very aggressive. 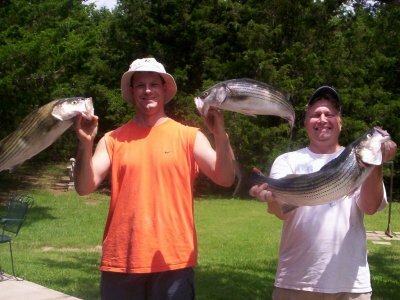 You can work these schools of smaller Lake Texoma stripers and find some good sized box fish along with some good sized sand bass. I'm fishing shallower water in the 15-30 feet range from the Mac Flats area to Washita Flats and as far south as West Burns Run. I'm having to cover a lot of water to find the fish and when I find them it is a matter of being patient and waiting them out. Once you spot them be patient, you don't have to see them on top chasing shad to catch them, shut your motor down and trust your electronics. For those of you who like to catfish, it is easy pickings off North Island using live shad. Drop your achor, sit back and the blue cats will find you. A lot more boaters are out on Lake Texoma now that several of the marinas have reopened after the flood. Stay alert and watch the boats around you and remember that SAFETY is always the most important thing when you go out on the lake. Keep you life jacket on when underway and remember that all children 14 and under are required by law to wear an approved floatation device when your boat is moving.